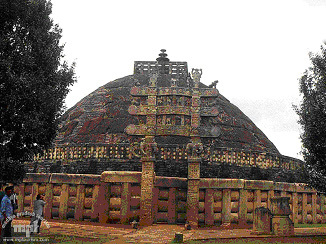 The Great Stupa of Sanchi is one of eight “stupas” constructed by Emperor Ashoka (273-236 BC). Over the course of 1,500 years spanning 3rd century BC and 1200 AD, adherents of Buddhism constructed a total of 50 stupas. Of these, the most well-preserved and celebrated is the Great Stupa of Sanchi. Sanchi was not visited by the Buddha and the real significance of this structure is not known. However, they were probably erected to encase the remains of great Buddhist teachers or important relics. Unlike the “Ashoka Pillars”, the innumerable pillars that Emperor Ashoka erected all across India to carry edicts of Buddhist teachings, the stupas were mere symbols. They stand tall, also, as showcases of Buddhist architecture. The Great Stupa was encased in the current structure in later years, probably during the reign of the Guptas in the 5th century AD. The current structure is 120 ft in diameter and 54ft tall. At the top is a triple “parasol” set inside a square railing called “hermika”, a raised terrace enclosed by a fence, and is for ritual circumambulation. At the base there is a stone procession path, enclosed by a stone balustrade. Finally, along the four cardinal directions are exquisitely carved gateways. At the top of the gateways are carvings that display scenes from the Buddha’s life. Sanchi is 68 kilometers North of Bhopal, the capital city of Madhya Pradesh. It sports the most well-preserved and numerous of the Buddhist Stupas in India. It is worth a trip for any one interested in the religious-intellectual heritage of India.